When protection and performance are critical, this Ultra version of the famous TD301 UltraThin version with the smooth back (no points) of the best selling, traditional, skintight police gloves delivers. 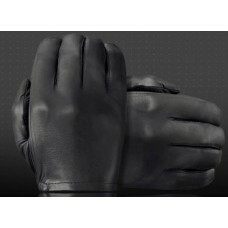 The Tough Gloves Ultra version of the famous Damascus D301 UltraThin™ Cabretta Police Gloves is nearly an exact copy of those hugely popular gloves that have been standard equipment in the law enforcement community since 1967. Damascus Protective Gear recently stopped making these tight leather gloves and have allowed Tough Gloves to make a version to the same high standards, so they're thin and flexible to allow maximum dexterity. You can write, search, handle firearms – any task needed to get the job done – without ever taking them off. Water-repellent, classically styled. These gloves are everything you could ask for in a high-performance patrol glove.